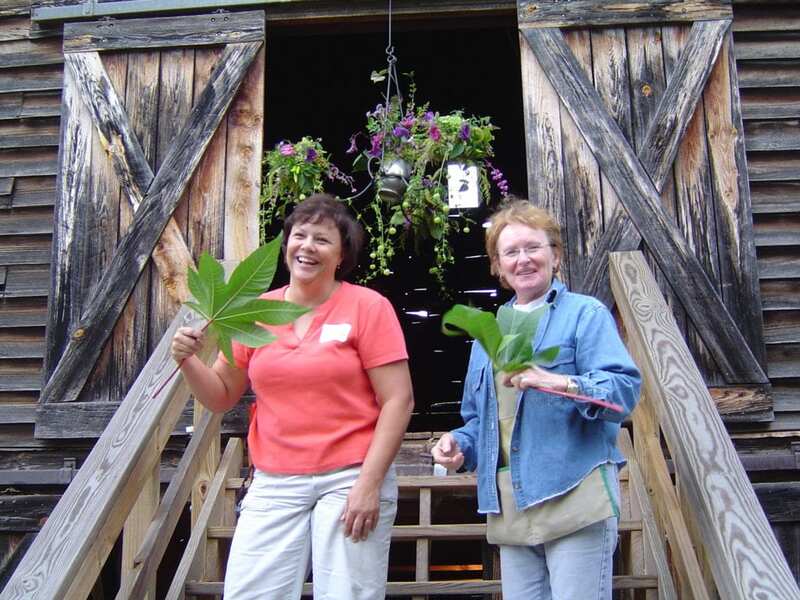 2005: Lisa and Suzanne go to Flower Camp! 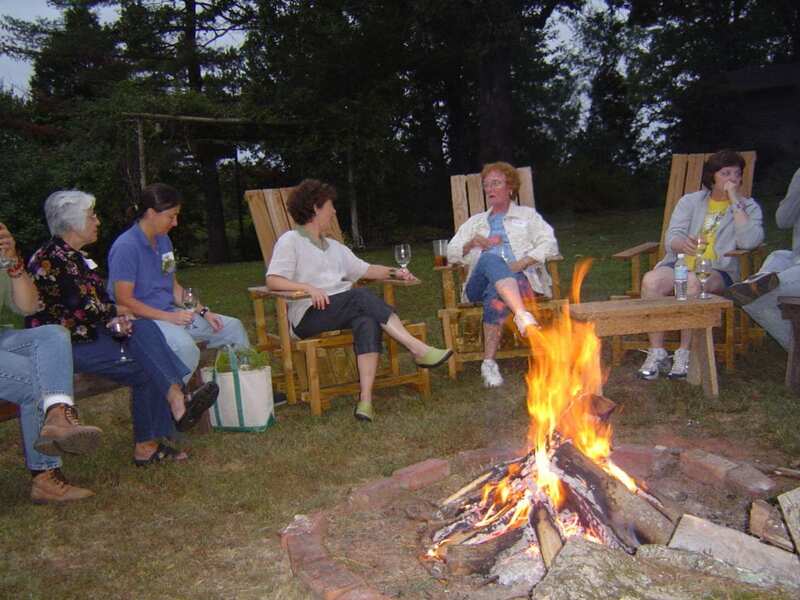 Sitting around the campfire enjoying the refreshments and the company. Suzanne and I had the wonderful opportunity to visit this magical place called Flower Camp back in 2005. 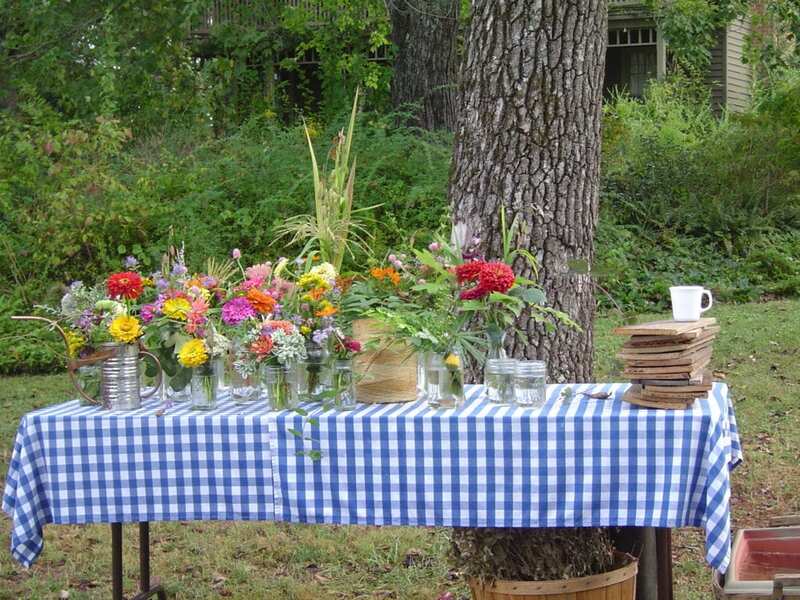 Flower Camp was owned and created by Nancy Ross Hugo, an author, amazing flower arranger, and was the longtime garden writer for the Richmond-Times Dispatch. Flower Camp has since been retired. I wrote this blog way back when it happen and I just pulled it out and dusted it off! We had so much fun. This is a trip every grown-up girl should take with girlfriends, sisters, mothers and daughters. If I had to summon it up into one word- (which you know I won’t) it was….dreamy. Two flower farmers that weren’t really sure how to relax in the presence of so many flowers! Notice I am still wearing my clippers! Left Lisa and right Amy Hicks. 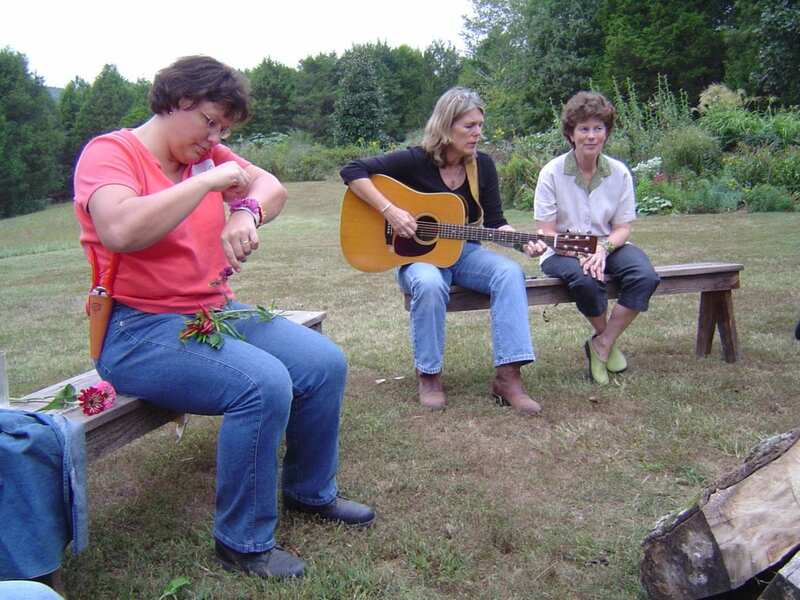 On September 23, 2005, my sis Suzanne, friend Amy Hicks of Amy’s Garden and I arrived at Flower Camp. On that Friday evening we gained entrance throuh a beautiful arbor that had a fitting sign that said “Flower Camp”. I felt as if I was walking into another world. We were welcomed by Nancy Ross Hugo the owner and given the simple instructions to go stake out our beds! Beds are assigned on a first come first serve basis and so we went to scout out the accommodations. We first took a look at what is called the “Big House” which is a completely renovated home that had been converted to a sitting room and several bedrooms with bathrooms- very nice- but already full. We then ventured across the path to checkout the “Cottage” which had an upstairs bedroom and bath with beds for 3, perfect for us. The downstairs of our cottage was where the Chef prepared and cooked all the meals – the smells where yummy! More accommodations where available in a recently built pavilion. 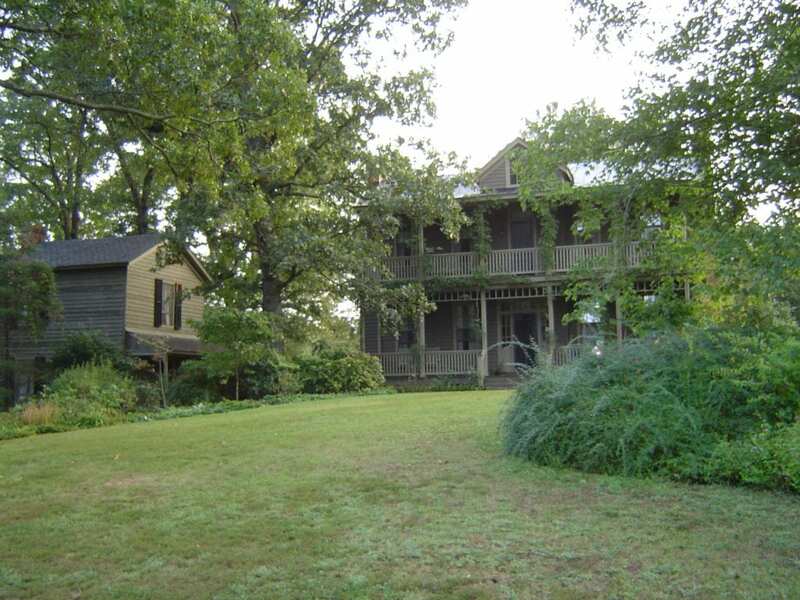 The downstairs had a large room for eating and gathering and was surrounded by a porch, the upstairs offering more sleeping quarters. The cottage we stayed in on the left, The “Big House” as it was called on the right. 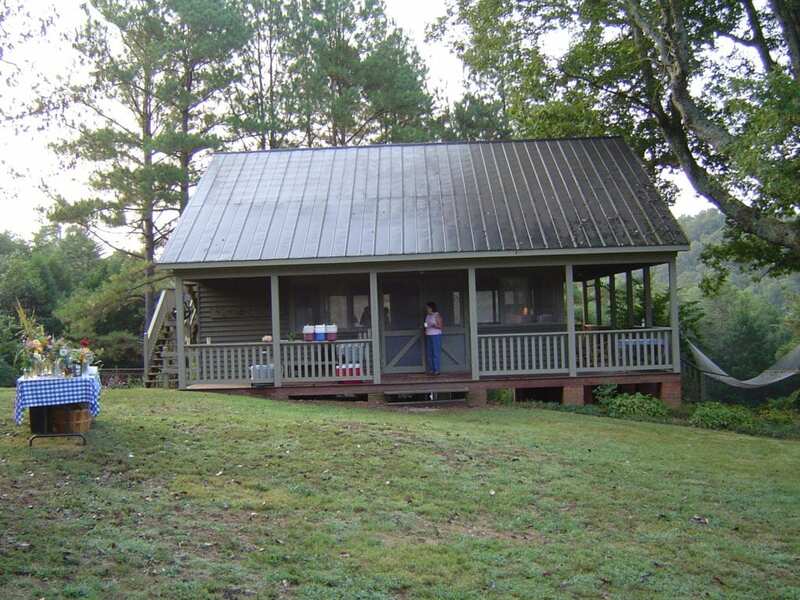 This is the pavilion that had a bunk room upstairs and a gathering and eating space downstairs. The porch wrapped all the way around. After surveying all of this, we drove our car down to the “Barn” to unload all the flowers we brought. You should have seen all the flowers already there, it was a flower arranger and gardener’s paradise! The entire covered breezeway down the length of the barn (I’ll guess 50 feet) was packed with beautiful cut flowers!! Wow!!! The barn was a masterpiece in itself! 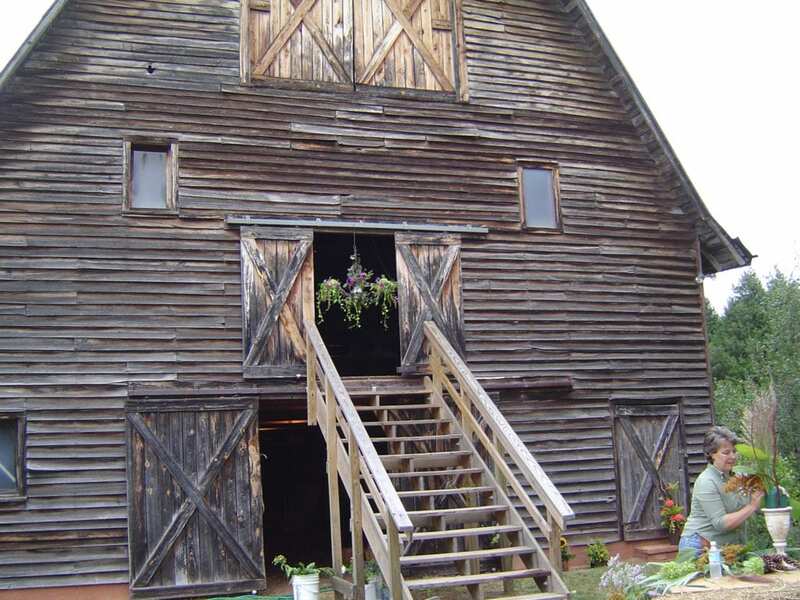 We went upstairs into the barn to put our dried flowers with the others. There was even more dried stuff up there then fresh down below, unbelievable really, After taking all of this in, we ventured back up to the pavilion where everyone was congregating. At the pavilion, a table was setup with little jelly jars of water. We were asked to create a “handheld bouquet” using material collected from the property and return the bouquet to the jelly jar. We were to include at least one flower that says something about us and we would get a chance later to explain when we introduced ourselves. 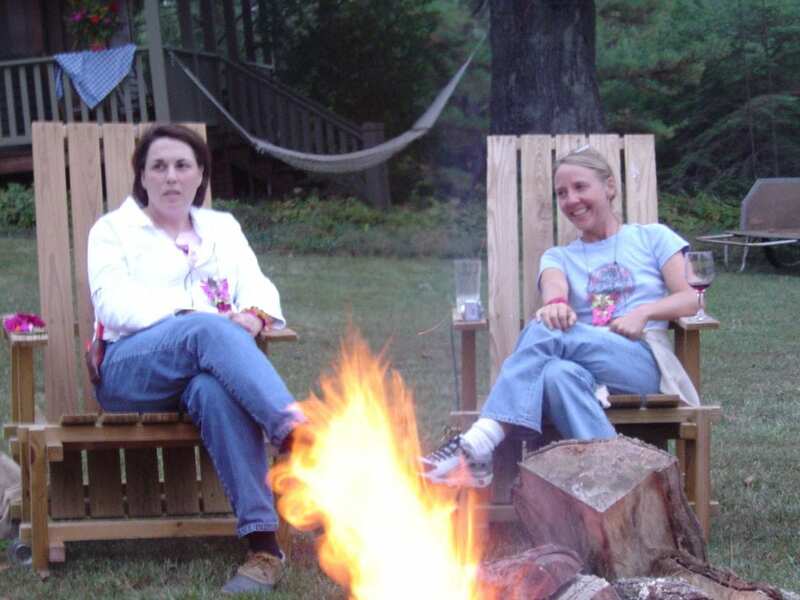 Later we gathered around the campfire on Adirondack chairs and benches and enjoyed refreshments. We introduced ourselves and told about the little bouquets we made. It was a riot and interesting to hear from the 24 ladies there. The bouquets we made that we’d be sending down the James River the following day. We headed to the gathering room for a delicious meal prepared by Erin and Kate. Following dinner we had a fun auction of the items we were asked to bring like plants, dried flowers, vases- just something you didn’t want anymore that somebody else might want- it was a hilarious! You only had $1 in change to spend total. We gathered again at the fire for socializing and then hit the sack. Saturday morning was beautiful, cool temps, coffee and a delicious feast for breakfast. We had a day full of activities; arranging demos by our coaches: Nancy Russo, Sue Tolson and Mary Garner-Mitchell, what talent! Then those who wanted to do arrangements did so with help available from coaches. Suzanne and Jackie used the most unusual vessel to build their arrangement. This is when Suzanne fell in love with Love-in-a-Puff vine! One of the challenges of the day was to be paired with someone you didn’t know and the two of you selected from the many unusually vessels to do a fresh arrangement . My sister Suzanne was paired Jackie, and those that know my sister won’t be surprised that they picked the most unusually container; a wrought iron chandelier. Suzanne and Jackie did a stunning job, it is breath taking! It was then hung in the doorway into the barn, my goodness it was beautiful. One of the other activities was to locate a vessel and a natural stylus for writing thank-you notes the next day. 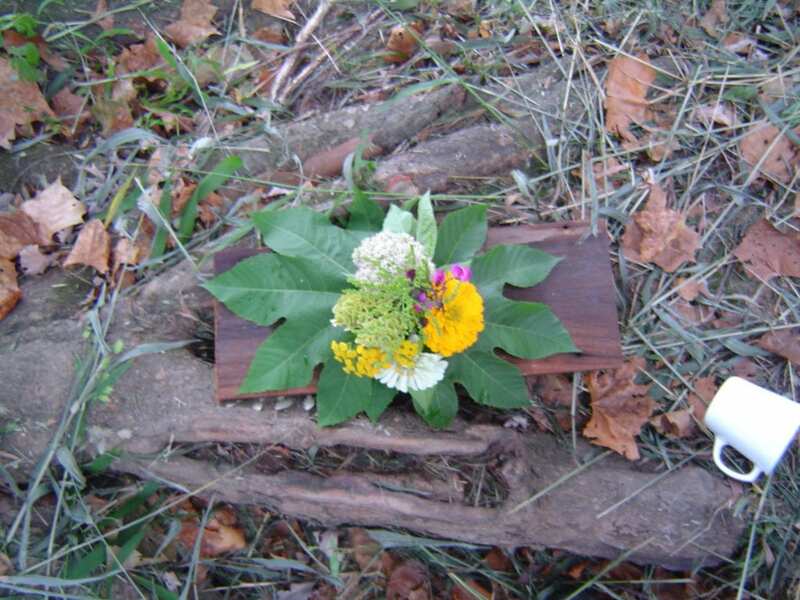 Then we did the most awesome thing: we placed the little bouquets we made the night before in a small hole in a board that we prepared and hoped would float. We took the nicest little 10 minute walk down to the James River with our bouquets and boards in hand. At the river one-by-one we put the bouquets on our boards and tossed them in the river! We watched as they floated away!! It was one of the most picturesque things I have ever been a part of, it was just… dreamy! I imagined casting all my concerns on that board with the flowers and just watched them float away down the river! 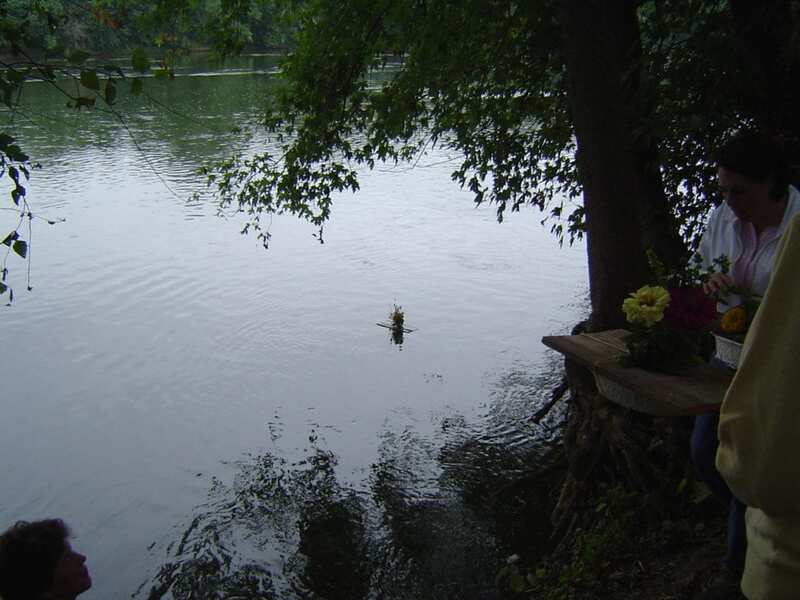 Can you imagine sitting on the deck of your home on the river and having a group of bouquets come floating by? Best activity ever Nancy! 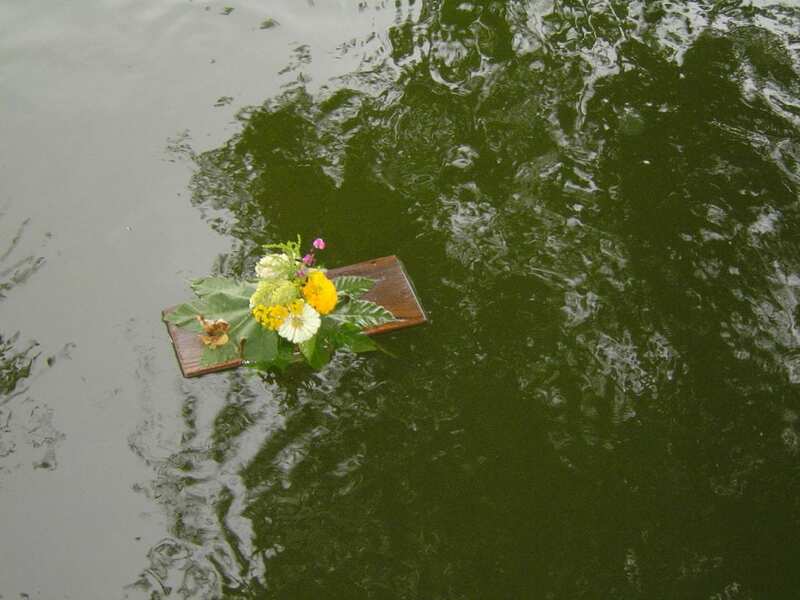 The bouquet I made, ready on it’s little float. Tossed into the James River. Watching it float away down river. The other activity that I thought was just too much fun was creating “duct tape” jewelry. 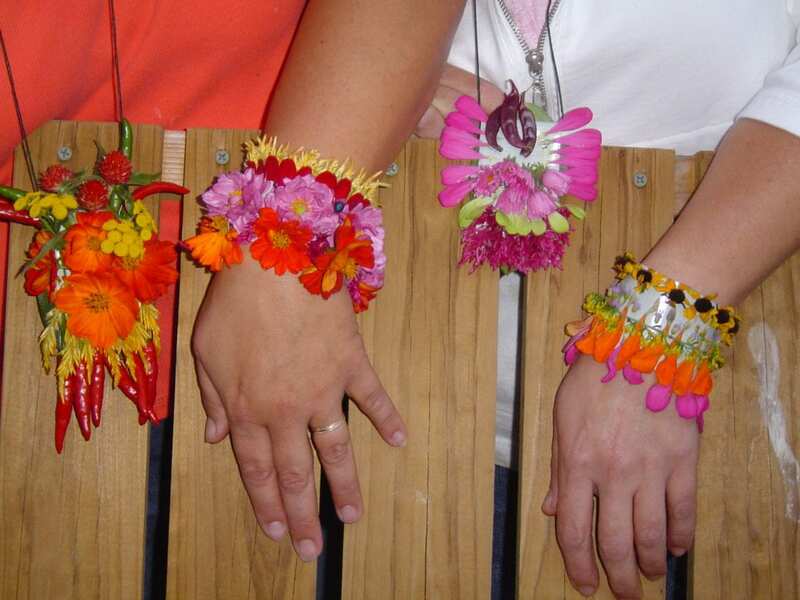 After preparing your “duct tape” you walked around the grounds and garden and picked flowers, twigs, pods and decorated by sticking them to the tape- it was so much fun! Suzanne and I were all decked out in duct-tape jewelry! Then the campers gathered, adorned with our jewelry for hors d’oeuvres. After much socializing, we had a scrumptious dinner out on the lawn by candlelight. This was followed by warm mango cobbler with ice cream served by the campfire. We had fabulous music by Debbe Peck playing the guitar, singing some great tunes and even leading us in a couple of songs….incredible I tell you. Sunday morning started out with a song lead by Anslie, a fellow camper to bless our morning meal! Another yummy meal followed. We headed to the barn for dried flower wreath and arrangement making. Nancy gave tips and all were empowered to give it a try. The barn was full of every kind of dry good you could want- lots of different types of hydrangeas, peony pods, grasses, and so much more. We worked for a couple of hours to make our masterpieces to take home. As we finished our dried projects we headed to the pavilion for our last activity before lunch, writing the thank-you notes. A very thought provoking and moving project. We gathered our vessel for ink and the stylus to write with that we had collected on Saturday and reported to the pavilion. Nancy gave out sheets of tree bark from a river birch tree for our paper, filled our vessel , mine an acorn cap, with poke-weed juice for our ink. Our charge: to thank someone for a special or meaningful word or gesture from the weekend. We each searched out a place on the grounds to be alone and wrote our note. The notes would never be read; you hid them after writing where they would once again become part of the environment. We gathered for our last meal together and prepared to depart on our journeys home to join the real world again. We met people and left with many friends. It is great to spend time together with others that are passionate about your passion! Today Nancy and her daughter Kate have a business called The Arrangers Market. You can find beautiful vases and supplies and they offer arranging classes!